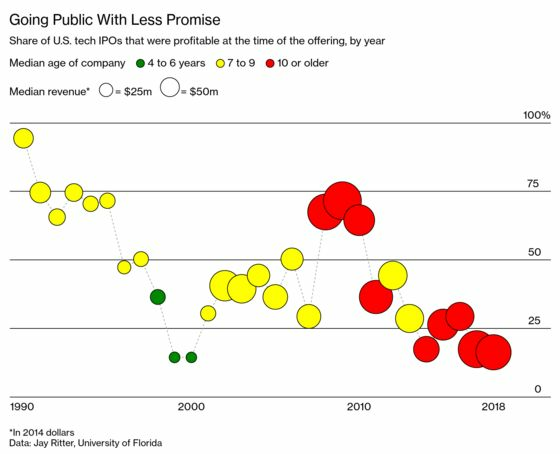 (Bloomberg Businessweek) -- Among U.S. technology companies, particularly unicorns—those valued at $1 billion or more—2019 is shaping up to be the biggest year since the dot-com bubble in terms of the total value of stock sold in initial public offerings. Lyft had its IPO at the end of March; Pinterest is next, and Uber Technologies is coming within weeks. Silicon Valley’s dirty secret is that these IPOs are just a sprinkling of rain in a desert for thirsty investors. So far in this decade, $644 billion has been put into young U.S. technology companies—by maverick venture capitalists, stodgy mutual funds, and just about anyone else with money to spare, according to financial data provider PitchBook and the National Venture Capital Association. The global figure is approaching $1 trillion. Those investors eventually must be paid back and generally want at the very least twice what they put into a fledgling company. In the same period, about $824 billion in cash has been returned to U.S. startup investors from IPOs, acquisitions, and other deals. The relatively small premium on all that money rushing in should worry investors expecting to double their value—let alone those who imagine receiving much bigger windfalls. Acquisitions have historically been the most common way for early investors in tech startups to get payback. But as the elites grow older and more richly valued, IPOs are overtaking such deals. Last year and in 2017, IPOs accounted for more than half of the money returned to startup investors. Still, we’re going to need a lot more IPOs for the unicorn era to turn out to be as magical as the name suggests. Today’s young tech companies hardly qualify as “startups.” The typical tech company going public in the U.S. is older and has far more revenue than its counterparts in 2010. And almost none are profitable. Ovide is a tech columnist for Bloomberg Opinion.